What we do can be summarized into five main areas: Advocacy & Policy Development, Research & Training, Education, Coordinating & Unifying, and Protecting the Integrity of Organic in Ontario. The largest opportunity to influence agricultural policy is at the provincial level – where agricultural policy is regulated. Government and ministerial staff want to engage with a single representative for organic issues with a cohesive voice. We have the knowledge, skills, and patience necessary to advocate for organic on behalf of Ontario’s organic enthusiasts and industry. We participate in meetings with Ministers, Deputy Ministers, and Opposition Critics. We champion the organic agenda with commodity groups and other provincial organizations. We provide input and testimony on important legislation. We give people and industry a way to voice their values. We facilitate funding for organic programming through grant-writing and support letters. We facilitate direct conversations between policy makers and Ontario’s organic producers. We need to ensure that existing and transitioning organic producers have easy access to the information and practical tools they need to continue on as successful certified organic farm operations. We’ve formed partnerships with academic institutions, NGOs, industry conferences, commodity groups and policy makers to understand what the organic sector needs to be successful and to help develop and deliver training programs. We lead primary industry research to address the barriers to organic transition. We participate with the Organic Agriculture Centre of Canada and the University of Guelph by consulting with the organic sector and identifying research priorities provincially and nationally. We participate on conference planning committees to ensure a focus on organic and sustainable agriculture is included in conference programming. We support the Ecological Farmers of Ontario and other NGOs to deliver mentorship and advisory services for producers. We develop and deliver training seminars, programs, production clubs, transition support and professional development along the entire organic value-chain. There remains a lack of clarity amongst most Ontarians as to what organic means exactly. It is important for people to understand what makes certified organic different from organic, natural or local food choices so that individuals can make informed decisions about the food they choose for themselves and their families and to be sure their choices represent their personal values and expectations. It is just as important for those working in the conventional farming sector to be informed on organic in order to create understanding and respect for all farming methods. We are experts in certified organic and are able to inform on the full value of organic. We provide accurate information about organics and timely response to confusing or misleading information appearing in the media. We create online content, printed materials, newsletters as well as create and attend events and seminars to inform on the value of organic. We work with commodity to groups to ensure accurate information is shared about organic with conventional farmers. Huge advances can be achieved by working together as a united organic movement. By uniting business along the organic value-chain, like-minded organizations, academic institutions and individuals who share the same values, we increase our pool of talent and capabilities. Through our network, we achieve greater efficiencies, are able to learn of and respond more effectively to challenges and better know what solutions are needed. Our ability to contribute to the prosperity of the organic sector depends greatly on the size and participation of our membership. We are the Liaison between industry members, individuals and families, connecting businesses to other businesses, people to organic producers and suppliers, and people to people. 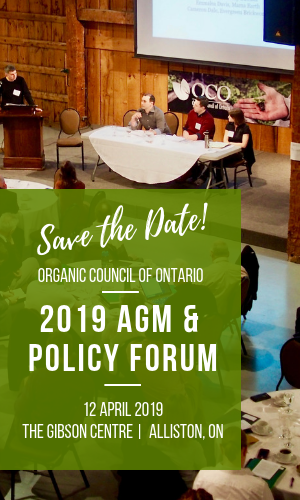 We unify all participants of the organic movement in Ontario, connecting those with shared values and providing a means to express those values. We consult regularly with industry members to determine and act on issues. Participate in numerous round tables and advisory committees and collaborate with other NGOs. We produce newsletters which keep our members informed of current news, issues, research, programs, and accomplishments. We plan and coordinate events which bring our membership together in the same room. We are available for on-demand support through the OCO office and website. Upholding the integrity of the organic standards requires constant vigilance. Pressure from industry to augment the standards means a constant risk of weakening the standard. Some changes are necessary to make the standard practical to adopt by all sizes and types of producers, but great caution must be taken to ensure the Standards work for the industry without loss of integrity. We appoint the Ontario representative to the Ontario Federation of Canada, providing a channel of communication to pass issues and information up to the standards committee and back out to our members. We work with stakeholders across the province and country to clarify organic in Ontario, and to protect the integrity of the organic brand. We are championing the adoption of a provincial organic standard to close a loophole that only requires organic certification under the Canada Organic Standard if a product crosses a border, this will reduce confusion in the marketplace and protect the integrity of organic in Ontario. We develop materials for membership to combat misinformation connecting “natural” “local”, “___-free” and other unverifiable claims with the values delivered through organics. We work to ensure adequate funding of the Standards’ maintenance and improvement. We direct industry feedback through our seat on the Organic Federation of Canada on regulatory issues, enforcement issues, and standards review. SPONSOR AN INITIATIVE! We are working on behalf of all Ontarians to change our food system. We need your support- whether you are an organic business operator, an organization with a sustainability charter, or a concerned citizen, OCO welcomes financial and in-kind support to sponsor one or more of our many initiatives. To get involved with one of our initiatives, or to learn more about projects in development, please contact our office. BECOME A MEMBER: Membership is open to all willing participants of the organic movement. We have membership levels for all types of businesses along the organic-value chain, as well as like-minded organizations and individuals.